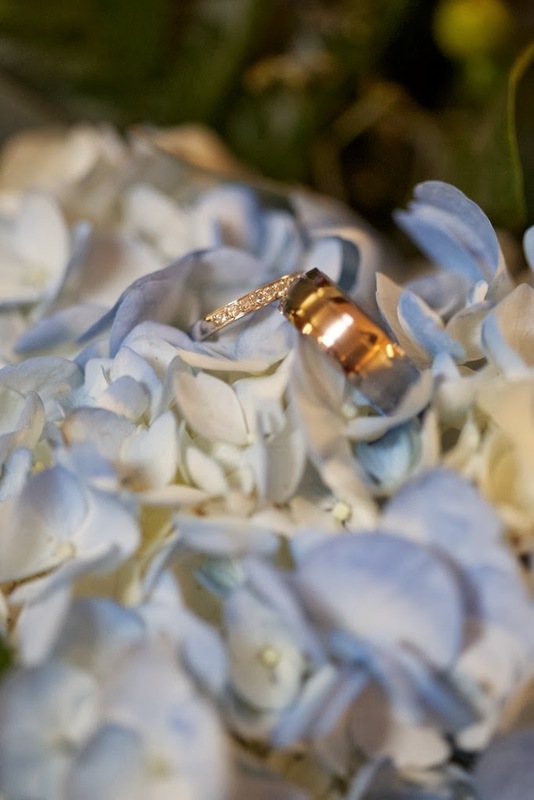 Flowers are everywhere when it comes to your wedding day. Bouquets, boutonnieres, corsages, alter pieces, and centerpieces. Ask people who have recently got married who they used and what they thought. Try not use a recommendation from someone that hasn't gotten married yet. You want to hear how the actual wedding day went. Have a budget. Communicate this to your florist. Meet with 3-5 florists. During the meeting share your vision, likes, dislikes, and expectations. Listen for statements that let you know your florist is educated and will do a good job. Ask yourself "Which florist did I like the most?" 75% of the florists we met with, I walked away saying "wow, florists are crazy nice and have such a fun personality!" So if you leave a meeting say "what a dud" remember they are going to be creating your wedding flowers. Do you want to pay them for a service and not be happy with the product? I had tossed around the idea of making our own centerpieces for the reception. We had done this for my sister's wedding and it worked out well. But there are a few things you need to keep in mind if this is the route you choose. Where are you going to order the flowers from? Jess had the wrong flowers sent to her the week of her wedding (bright Home Depot orange!) and had to make some quick decisions on what to do. This can be a very time consuming task. It took us close to 4-5 hours to assemble the centerpieces. Once you create the centerpieces you need to safely get them to the reception hall. 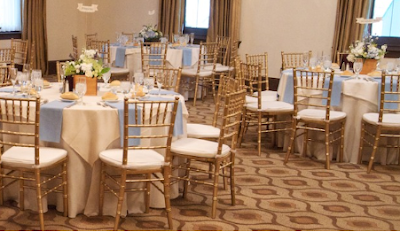 This was not an issue with her wedding, because we created them at the hall. A professional florist is equipped to travel with 10-15 centerpieces and knows how to handle the amount of water in the vases, etc. So, this can be fun if you can figure out all of the details. In the long run I decided to have a professional florist create all of my center pieces, bouquets, boutonnieres, and corsages. Honestly, it was one less thing to stress about when it came down to 'crunch time' (i.e. 48 hours before the wedding.) I liked knowing my florist would deliver everything and set the centerpieces up for us. As most of you know finding the perfect florist is just like finding the perfect DJ/Emcee. At first I thought this task was easy. My mom's friend recommended a florist to us. We called her up, made an appointment, met with her, and loved her! She told us she would get back to us in 2 weeks with a quote. I waited patiently, and after 2 weeks I called her once a week...for 6 weeks. Yup, 8 weeks after our first appointment is when I finally received the quote! If you can't keep your promise with typing up and giving a potential client a quote, there is a small possibility you are going to mess up on my wedding day. Not taking that risk! My mom and I did some research online and set up about 4 more meetings with potential florists. It was a pretty easy decision. We went with the florist that was easy to talk to, knew her stuff, gave me several suggestions, showed me pictures of her past work, and gave me the impression she loves what she does. It also helped that she provided me with a quote in 7-10 days, as promised. I highly recommend Kris Gardy at Colonial Gardens if you live in Phoenixville, Exton, West Chester, Pottstown Area of PA.
My Bouquet had ins and outs (not a round mound), with seeded eucalyptus and rolled thin grasses for a touch of green, a mixture of blue hydrangeas (my FAVORITE! ), white roses, spray roses, white calla lilies, white stock, blue salvia, and pale blue delphinium. To match the 'bling' theme, she added clear crystal pics in the center of the roses and a band of rhinestones around the satin ribbon on the handle. She worked in my grandmother's handkerchief, which was my 'something old'. The bouquet cost $200. It was really hard to decide what blue flowers wouldn't clash with the bridesmaids dress so we decided to have them carry green and white bouquets with blue crystal pics in the center of their roses and a hint of blue iridescent beads on thin silver wire worked in for a touch of blue. Their bouquets were had a combination of dusty miller, green spray roses, green hydrangea, white salvia, white roses, white calla lilies, and green hypericum berries. Each bouquet cost $65 and in total it was $325. 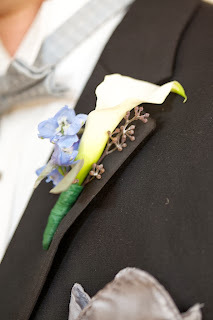 The groomsmen had white calla lilies with green hypericum berries. The cost was $12 and in total it was $60. We wanted the Dads and Grandfathers to be a little different than the groomsmen. Their boutonnieres had a white rose with green hypericum berries. The cost was $10 and in total is was $40. 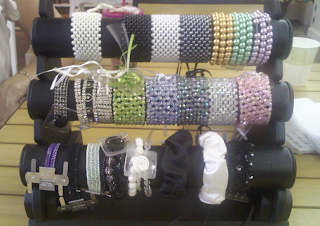 Our moms wore wrist corsages on white pearl bracelets. They were able to choose from bracelets the florist had or bring the florist a bracelet. The florist told us she can work in flowers into mostly any bracelet, which is pretty cool! I suggest Charming Charlie (a jewelry fanatics heaven!) 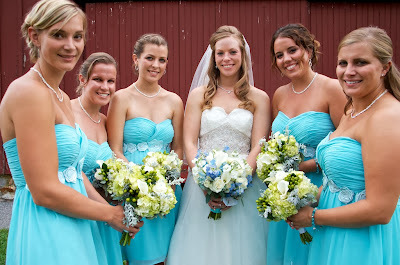 Their corsages had a mix of white and green flowers to match the bridal party. We made sure to tell the florist their dress color. The cost was $30 and in total it was $60. The Grandmothers had pin-on corsages in neutral colors. They were given the option of a wrist corsage (it was nice to give them a chioce!) The cost was $20 and in total $80. For the Church we decided on 1 long and low piece to be placed on the altar. 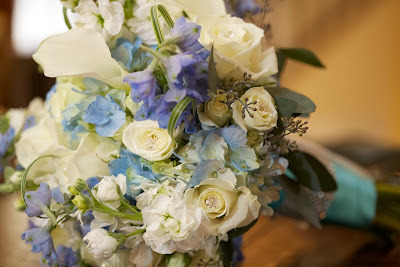 It had a mix of blue, white and green flowers to compliment the wedding parties flowers. The cost was $125. You can either bring this with you to your reception or leave them for church the next day. We also had 2 single white roses at the front of the Church in honor of Matt's Grandfathers. We provided the vases to the florist. 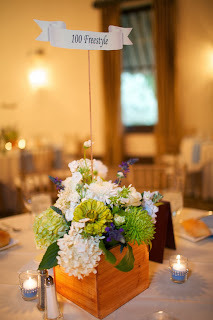 I had always known I wanted a low centerpiece at the reception because I have been to a few weddings where you can't see the people across from you because of the tall, bulky center piece. Yes, they are gorgeous, but they are also outrageously expensive and block your view from each other. I had seen a wood box centerpieces somewhere on Pinterest and knew that is what I wanted. After looking around in stores such as Tuesday Morning and online I finally found a site that was reasonable. I got a case of 12 wood boxes for $84 from Jamali Garden. 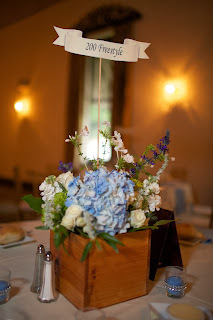 We stained the wood boxes and then supplied them to the florist a week before the wedding. Each box had a combination of hydrangeas, roses, spray roses, stock, salvia, seeded eucalyptus and a few other fill flowers. The cost was $55 and in total $825. Don't forget to think about how to give away your centerpieces. It's one less thing to take home, I mean do you really want 15 centerpieces in your house (flowers dying while you are on your honeymoon).. I didn't think so. Make 12-15 wedding guests super happy by giving them the centerpiece. To give away our centerpieces we had Abe, our Emcee, announce the person that traveled the farthest got to take home the centerpiece. You can also do person who has known the couple the longest, person with the closest birthday, etc. 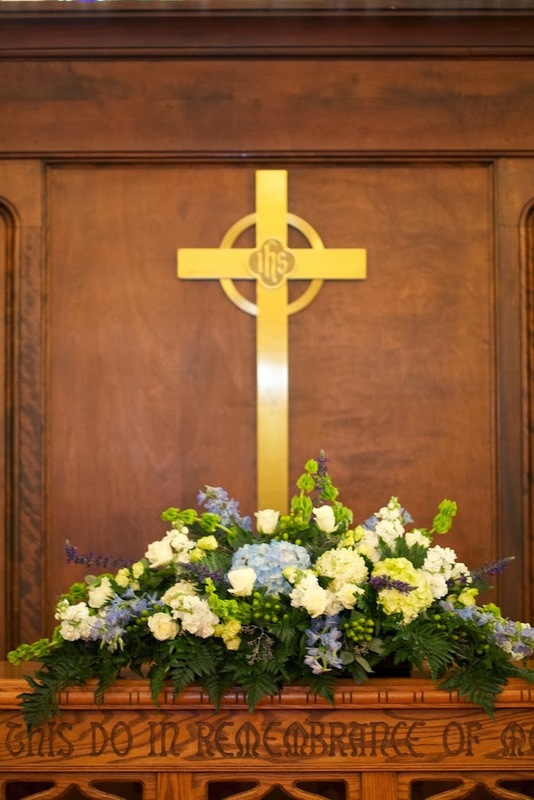 The delivery and set up fee was 150$, which is reasonable considering she drove the bouquets to my parents house, the boutonnieres, corsages and altar piece to the church, and the center pieces to the reception hall. Yes, flowers are expensive, but they have such beauty that really adds something special to your wedding. There are other alternatives to bouquets and centerpieces. You have to ask yourself what you are willing to spend, what your vision is, what you have always dreamed of.... AND make it happen! One last tip, don't forget to feed your flowers, my florist had us put our flowers in water when we were in the limo to keep them lively and good-looking.